The Tarlton Law Library began to collect early law dictionaries systematically in 1988 to support the Oxford Law Dictionary Project at The University of Texas School of Law. After the project ended the collection continued to grow. The largest single acquisition came in October 2001, when the library acquired 21 dictionaries at the Birmingham Law Society auction in London, thanks to a generous gift from Joseph D. Jamail (UT Law Class of 1953). The collection focuses on law dictionaries from the Americas, the British Isles, and Western Europe. Among the over 200 editions are the Tarlton’s Millionth Volume – an early edition of the first English law dictionary ever printed – John Rastell, Exposiciones terminorum legum anglorum (London, c. 1530), and the oldest book in the collection, Vocabularius utriusque juris (Strasbourg, 1476), and its Million-&-First Volume, Vocabularius utriusque juris (Basel, 1488). Even within such a seemingly narrow field there is wide variety in typography, format, and intended audience. Many of the most important printers in Europe are represented in the collection. These individuals and their workshops produced dictionaries in all sizes from tiny duodecimo pocket dictionaries to large folio editions, written not only for scholars, law students, and practicing lawyers, but also for merchants and other lay persons. Although editors and compilers designed most of the dictionaries to be as comprehensive as possible at the time, some works are little more than glossaries. A few volumes in the collection are alphabetically ordered reference works rather than a sequence of words and their definitions. This online exhibit highlights a selection of the finest dictionaries in the collection. Image of Vocabularius utriusque juris: difficillimas quasque voces iuxta receptos iuris interpretes edifferens. 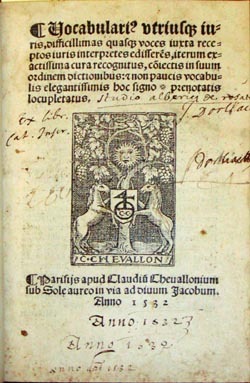 Paris: Apud Claudiu[s] Chevallonium, 1532. 17 cm. View a complete list of the early law dictionaries held by Tarlton Law Library.